Sometimes, people get confused in terms 'Blog' and 'Website' and It seems same for them. But these two terms mean different; Blog is a regularly updated web page, typically run by an individual or small group, that is written in an informal or conversational style, whereas Website is more professional and contents are static. We can update the blog daily but can't do the same with a website. Today every business has a website to grow their business and build existence in online market. The Main aim of websites are to promote the product, things or services offered by a company or individually. Websites are considered as a good source of advertisements. Blogs are different from websites as main motive of a blogger is to deliver useful articles to the readers of their blog for free. A blog has more content than a typical website. Blog is a Web page that serves as a publicly accessible personal journal for an individual. A blog is a discussion or communication site published on the world wide web and consisting of posts typically displayed like the most recent post appears first. A person who is participating in managing blogs or say like an owner of blog is known as a blogger. The Process of managing and writing blogs is called Blogging. A website is a location connected to the Internet that maintains one or more web pages with a specific purpose. Generally it is owned by business owners and individual people who are offering some services or products to sell online or advertise. Website has some static pages, but some time websites also manage blog to drive traffic from their blog to website to generate leads and traffic, which may convert into sales. You can also check personally that above given sites are providing some services or sell their products online. I am using blogger's platform to managing Tips2secure, so I would recommend my blog visitors also to use blogger as a blogging platform, because its easy to use and install their widgets. It is also SEO friendly as it is owned by Google. To create a blog your..
#1. 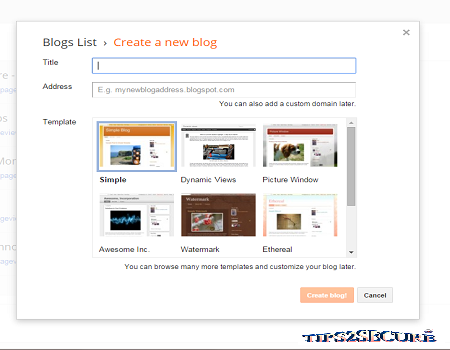 First step is login in Blogger using your google account. If you don't have Google account or Gmail address then you have to create a account first using their 'Create a New Account' option. #2. After login Click on 'New Blog' and it will show a pop up window as shown in below image. #3. Give title for your blog, then URL and then select a suitable template for your blog. #4. Click on 'Create Blog' and your blog is ready. #5. Now start writing your blog. Divide Blog Post in 5 Parts to Write a Great Blog Content in 20 Minutes. Creating a website is little tough and difficult than creation of blog. To design a website you may have to pay for hosting services. Also some sites are providing free hosting services but sometime they will show their ads later on your website. If you are not familiar with web designing, HTML and PHP then you also have to hire a designer to design your website. Message: I hope that you have enjoyed 'How Does a Blog Differ from Regular Websites? [Detailed Study on Blog]' article. However, if you want me to deliver more articles then please share my post. You can use Social Sharing Widget provided at the end of every post. After all, Sharing is Caring!.